You know when you see something you know you won't forget it because you liked it so much. Well, that was me years and years ago when I opened a Pottery Barn Kids catalog. I saw the below image, or something very similar to it. It was a painted trough sink for a kid's bathroom. 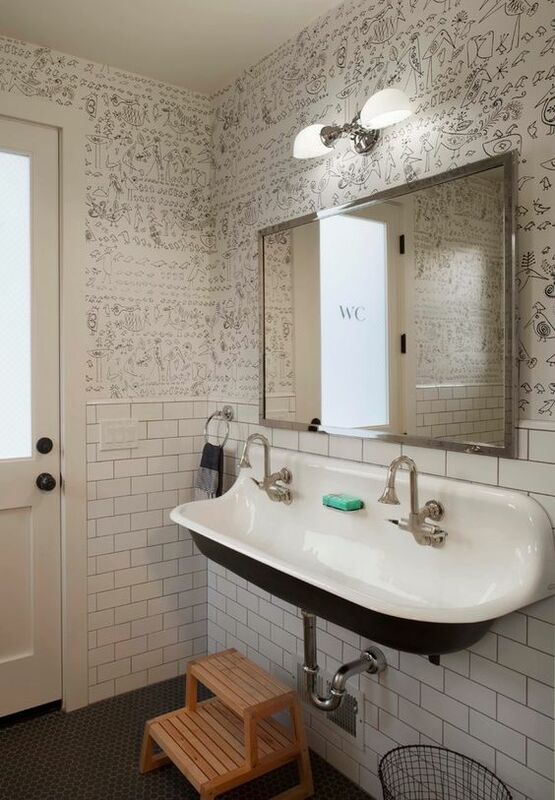 I've always had that image filed away in the "if you ever get to design your kid's bathroom" folder. Well, now that we're moving, I'm hoping to find a home where I can put our, ok, my stamp on it. I tend to always do something for the boys first so I've really been thinking of their bathroom. The pottery barn kids catalog that started my love of trough sinks. pottery barn kids really does make the cutest things for little kids. As much as I do adore a painted trough sink I don't think they are a good option for every bathroom though. I need more storage, so for a master bathroom I probably wouldn't select it. And, well, for girls, they have so much hair and make up stuff there is no way a medicine cabinet would fill all their stuff. But boys, oh sweet boys. They're normally simple with just a toothbrush and comb. So a trough sink for a boy's bathroom I think would be perfect. Imagine if you painted the under side of the sink a royal blue and did royal blue and white penny tiles in the bathroom? Classic, yet so fun. Keep scrolling for more inspiration and let me know if you would do this. Also, wouldn't a trough sink be perfect in a laundry room or mud room? Where function meets style in the unexpected. Oh this is a great shot, I just wish they had taken down their shower caddy rack because all I see is Barbasol shaving cream and garnier fructis shampoo instead of the Hygge and West's Daydream wallpaper. But this is still a great bathroom. I'm really digging the window size and shape for this room. The unexpected lime green but with a classic black and white floor. Have some fun with it. Go with a classic floor but try a pop of color for the sink. When they grow out of the lime green, paint it black or white. Remember, that post I did a few weeks ago about taupe making a come back? Why not bring the color into your bathroom? 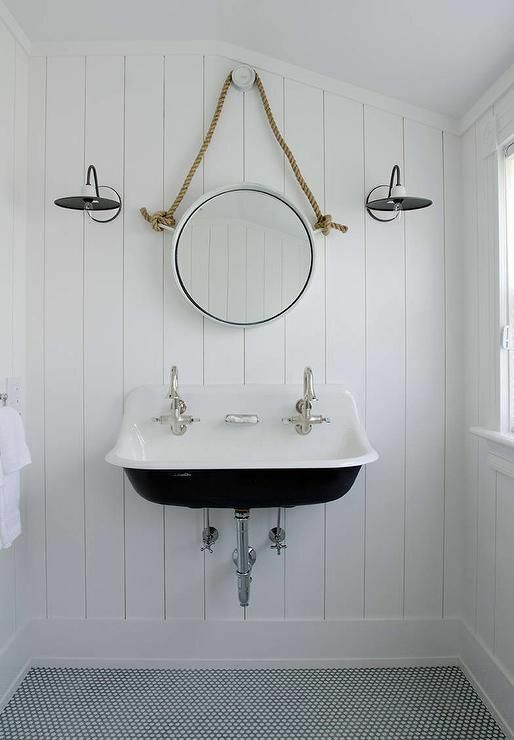 another subtle nautical bathroom. I'm really digging the rope mirror and lights. I can't handle how cute kids look just standing at this sink! Oh my goodness! Again, could you imagine 3 little ones standing here? They even have low mirrors for them! I'm going to have to stop looking at these it's giving me baby fever! OH THAT'S MORE LIKE IT. AN ADULT LOOKING SPACE. I GOT A LITTLE TOO INTO THOSE KID SINKS IF YOU GET WHAT I MEAN. VIA CEMENT TILE SHOP. ANOTHER FUN FLOOR! BUT IS IT BAD THAT I THINK THESE PATTERNED FLOORS WILL BE OUT SOON? OR RATHER, WILL JUST SHOW Around WHAT YEAR YOU DID YOUr BATHROOM? I'M A BIG FAN OF PAYING FOR THE UPCHARGE SO YOU CAN GET A BRASS TRAP IF YOUR HARDWARE IS ALSO BRASS. ESPECIALLY IF IT BUTS UP TO BLACK. CLEAN AND FRESH. JUST LOOK AT ALL THAT STORAGE IN THE MIRROR! THIS IS JILLIAN HARRIS', OF LOVE IT OR LIST IT TOO, NEW SPARE BATHROOM. ANOTHER CLASSIC COLOR COMBO, WITH THE TAUPE COLOR THAT I'M TELLING YOU IS COMING BACK. This is not subtle nautical, but I do really like it. And those mirrors!!! Design by Modern Organic Interiors. White penny tiles with black grout?!! uhhhh, yes please! another black and white classic by Rafterhouse. Oh my! How cute are those animal photos?